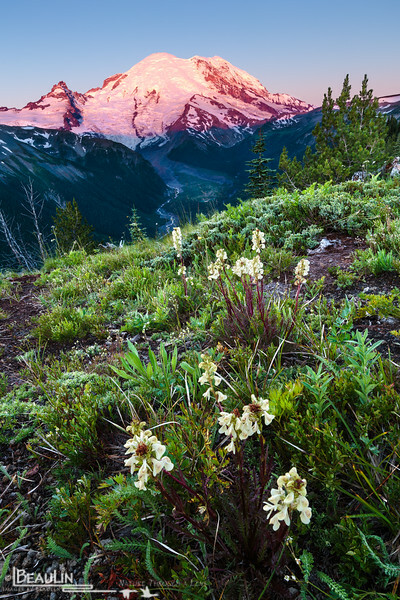 The alpine glow and first rays of morning light catch the east face of the United States' tallest stratovolcano in the aptly named region of Mount Rainier National Park known as Sunrise. Coiled-beak lousewort (Pedicularis contorta) and other subalpine meadow plants in the foreground cling to soil comprised of pumiceous tephra on the south edge of Yakima Park along the Silver Forest Trail, overlooking the Emmons Glacier and White River Valley. This photo is comprised of multiple exposures to capture the high dynamic range in the scene, and 12 separately focused images blended to achieve a tack sharp depth of field from 10 inches to infinity. This shot is not an HDR tone-mapped image.